The story begins in 1987 with fourteen-year-old June Elbus. June is the contemplative sort, she people watches, thinks seriously about the world around her, escapes to the forest often and dreams of living in a different time; Tell the Wolves I'm Home is June's coming of age story. June feels alone in the world and the one person she could be herself around, the one person who understood her, was the well-known painter Finn Weiss, her uncle, who recently died of a mysterious disease that not much is known of yet: AIDS. June is devastated and trapped inside the world she must now live in, the one where she continues to live a normal life with her antagonistic sister Greta and never sees Finn again. At Finn's funeral June notices a curious man separate from the crowd of attendees, little does she know that this man will lead to serious changes in her life. A couple of days after Finn's funeral June receives a package and a note, the package is a beautiful Russian tea pot she recognizes as one Finn wanted her to have and the note is from a man named Toby, who turns out to be the same man at the funeral, asking her to meet with him. June meets with Toby and soon realizes that he misses Finn as much as she does. For reasons June's mother is not quick to admit or expound upon, she resents Toby and blames him for her brother Finn's death. If June can learn to trust Toby anyway and become friends with him, then he just might be the person she needs the most to overcome Finn's death and grow in this uncertain world she is constantly wishing to escape. There are many coming of age tropes in this novel, the fact that June feels universally misunderstood and unloved, even completely undesirable, leads the reader to think of many other stories with main characters who feel the exact same way. However, I do believe that Brunt was able to write a different kind of coming of age story, one that sets the stage for how the world was working and the fears people had during the late 80's. Even though the general story line and summary could lead one to believe this is a YA novel, in many ways one could argue that it is a YA novel, I believe that it is rightfully sold as an adult novel. 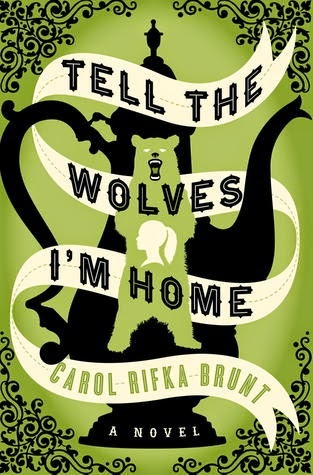 Tell the Wolves I'm Home is different from the first person YA narrative formula we are familiar with, stories about misunderstood teens who have lost their favorite person in the world. To start out with, this book does not have romance in it, not in the normal sense anyway. Familial relationships and friendships built between adults and teens dominate this novel. The romance found is that of love built between adults, as well as June coming to understand and love herself as she learns what being an adult means. There are poignant times of self-reflection. A simple phrase someone might say in passing, such as "Believe what you want," June turns into, "You could try to believe what you wanted, but it never worked. Your brain and your heart decided what you were going to believe and that was that. Whether you liked it or not." I will admit that there were times in the novel when I thought Brunt wrote scenes solely with the intent to make readers cry and the deepness was a bit overreaching. However, overall I did find this novel to be genuine and heartbreaking, as well as a novel that promoted self-reflection in me. When contrasting the late 80's with today I began to think of the stigmas and fears we have as a nation now, what the contemporary AIDS is. I highly recommend reading this new kind of coming of age adult novel and am putting it on my shelf to read again someday. The tea pot Finn wanted June to have, the one Toby made sure she got, was a Russian tea pot. It turns out that Russian tea is quite unique, it starts off with a black tea base then adds fruit juices (such as pineapple juice or orange juice) and spices (such as cloves and cinnamon), which individually aren't uncommon. This mixture of bitter, sweet and spicy is exactly how I would describe this book in a nutshell, which when they all come together the way Brunt writes them is quite uncommon. Some scenes will make you cry, some will make you laugh, others will make you enraged or simply intrigued, but they all juxtapose each other well and add up to a classic-style coming of age tale that will make you happy you tried it. This recipe looks like a really good recipe that will give you a taste of what Russian tea is like, a new mixture of things familiar.